A managed file transfer solution like GoAnywhere MFT is typically not a check-list item for weather gathering expeditions, but it’s what Andrew Rettig and Dr. Richard Beck took on their trip to Barrow, Alaska. Weather data gathering in the remote areas of Alaska is traditionally a manual process with stations monitored from nearby towns or airports. Real-time weather stations are limited by either the length of wire connecting them to a console or the feasible travel distance for regular readings. 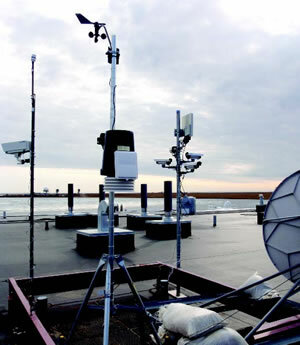 The goal of the University of Cincinnati project was to construct and monitor remote, unmanned weather gathering sites in near real-time, using standard equipment – thousands of miles away. Planning for this experiment began in 2000 with a grant from the National Science Foundation for developing a robust standards-based, automated science data system. The physical testing and construction began in 2007, before moving the equipment to Barrow Alaska in the spring of 2009. The standards based approach led Dr. Beck and his research team to find “off-the-shelf” solutions that would not only withstand the weather in northern Alaska, but also complete the task of sending that data back for analysis at the University. GoAnywhere MFT was the secure managed file transfer solution selected to translate the data feeds from the servers at the Barrow Alaska Research Center (BARC) to the University. Determining the data collection methodology and how to use the data were the easy parts. The team decided to connect the digital weather stations and cameras to 700MHz WipLL (wireless broadband) radio transmitters and capture the information on servers at the BARC. The analysis would determine a baseline and any new climate patterns for an area not regularly monitored with that level of detail. The issue was how to compile all that information together and securely transmit it back to the University. Rettig found GoAnywhere MFT through an Internet search and called on HelpSystems and the GoAnywhere team to help solve the University's file management challenges. GoAnywhere MFT was the link used to retrieve and translate the required data before sending it from the BARC back to the University of Cincinnati. The transmissions included meteorological readings from 14 weather stations and still images taken by the monitoring cameras. GoAnywhere provided all the time-stamp requirements and had the ability to restart a transmission if there was a “hiccup” in the connection, which is a common problem for Internet traffic in remote locations, especially over high latency satellite links. Andrew was a graduate student in the Department of Geography at the University of Cincinnati. His thesis work included developing and implementing a prototype for standardizing sensor networks. Dr. Beck is an Assistant Research Professor in the Geography Department at the University of Cincinnati. His research is focused on developing tools based on Geographic Information Science applied to physical geography.